Happy Thursday! 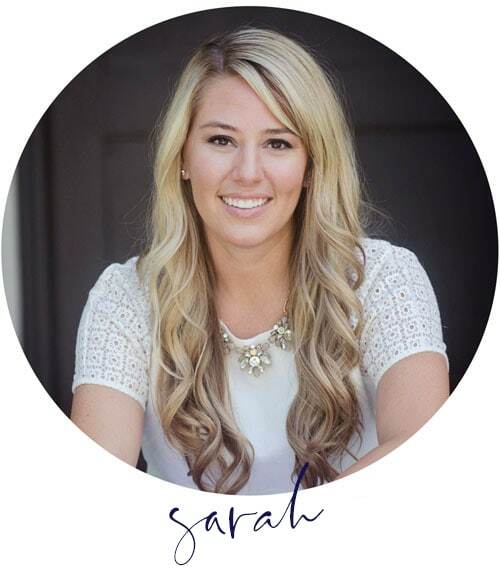 Today I’m going to be sharing Monday’s Weekend Recap and then later today, I’ll also be sharing this week’s Wednesday Watch List! We flew to Salt Lake on Tuesday last week to spend Thanksgiving with my parents and brother and sister-in-law. So, needless to say, I didn’t get many projects done around the house last week! 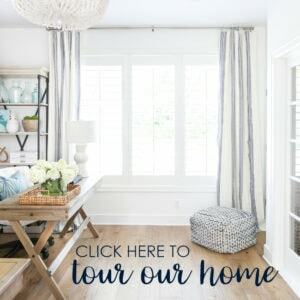 I’m hoping to wrap up all the final touches on my Christmas decor by the end of the day tomorrow and then I have my Christmas home tour to share with you next week! 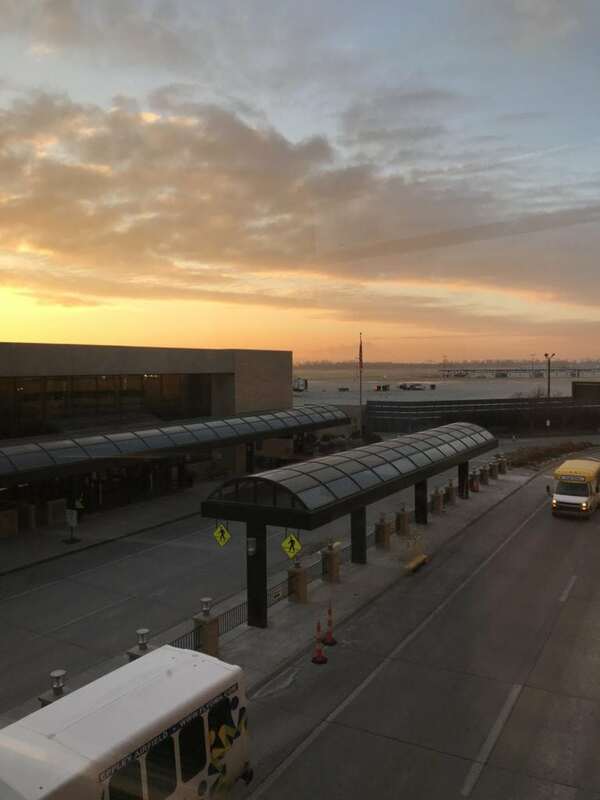 It was a beautiful morning to fly out of Omaha on Tuesday. Surprisingly, the airport was not that busy! We arrived in Salt Lake just in time for an early lunch. 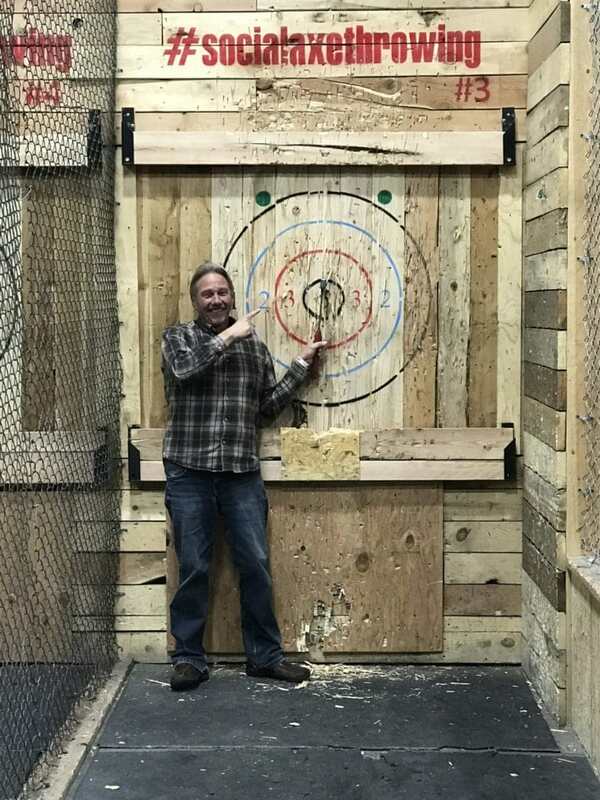 That afternoon we helped my parents with a few things around the house and then decided to go axe throwing that night! I promise it was every bit as terrifying as it sounds! I was so nervous I almost didn’t do it, but once I tried, I was hooked. It was a lot of fun! Kurtis and my dad were neck in neck for the first game, but by dad pulled off the win. 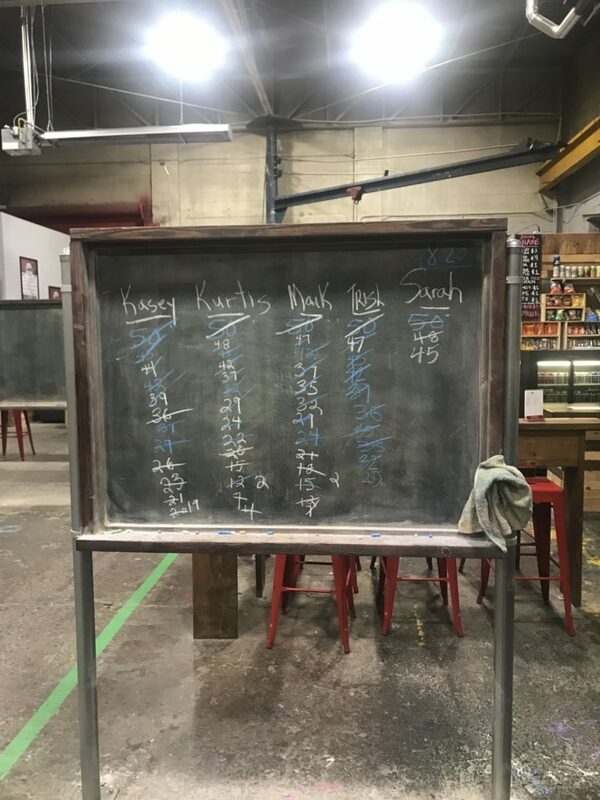 But Kurtis still managed to pull off a few wins – and I managed to at least not look too embarrassing by the end. If you haven’t tried it before, it’s a total adrenaline rush – and really anyone can do it! There was even a 90 year old woman a few stall down from us! 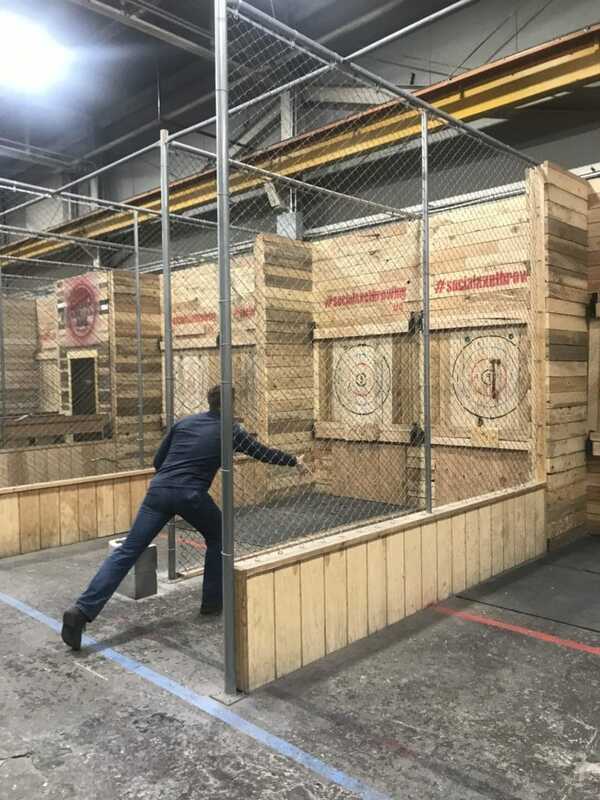 We have an axe throwing location in Omaha, but we had never been. It may be on our agenda this winter! Wednesday morning, my mom made us German pancakes with here amazing buttermilk syrup. I’m pretty sure the syrup could make cardboard taste good, but the pancakes were amazing! We spent much of the day preparing food for Thanksgiving the next day. It’s always so much work (mostly for my mom) but I feel like it was worth it in the end! 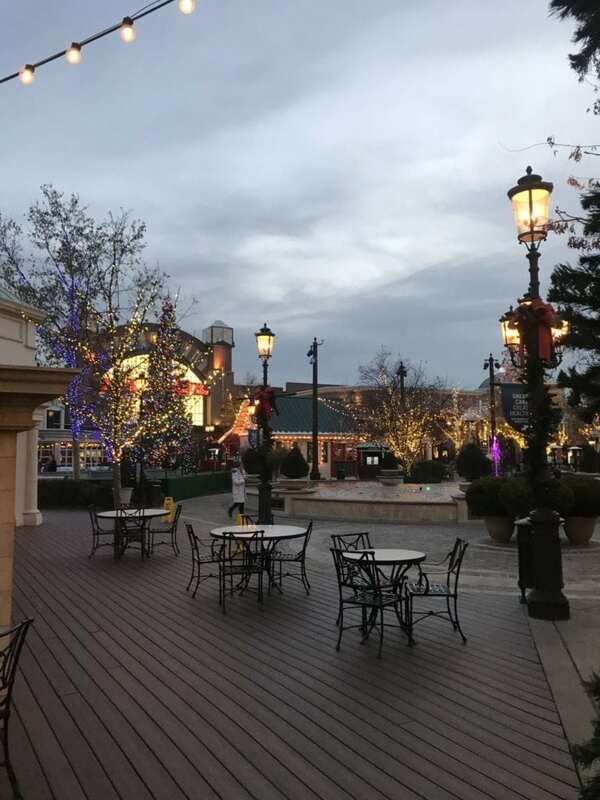 Wednesday evening, we headed out to Farmington Station for some shopping and then dinner at Twigs Bistro. We were celebrating my sister-in-law’s birthday (the 26th) and my mom’s birthday (the 28th). Their lights were already up and looked so beautiful and festive! We headed home for some games. 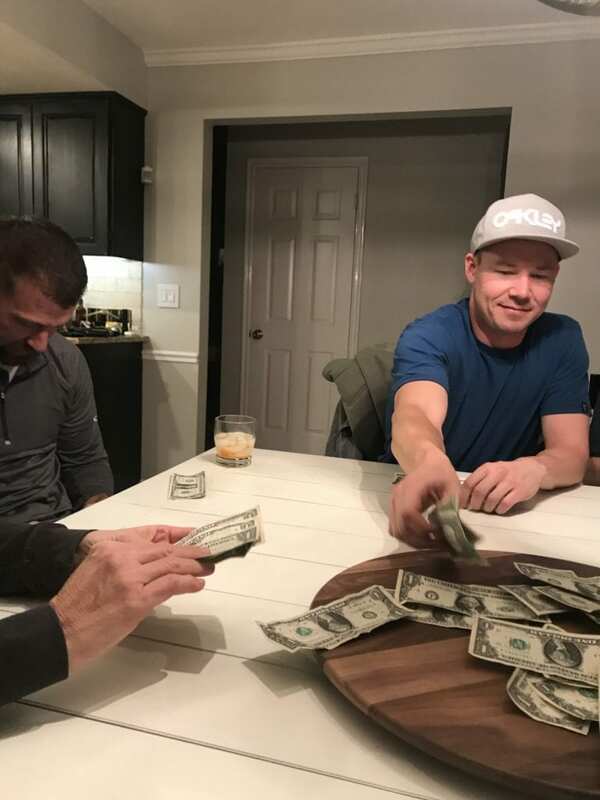 If I haven’t told you before, my family is just a little bit competitive. And by little, I mean a lot 😉 We started by playing this game and put the lazy susan we got my mom for her birthday to use! It worked just as well for money as it does for food! We then managed to squeeze in a few rounds of my all-time favorite game. Thanksgiving day we had a feast fit for a king! My mom is an amazing cook and it was all so good. Her tablescape was beautiful too! 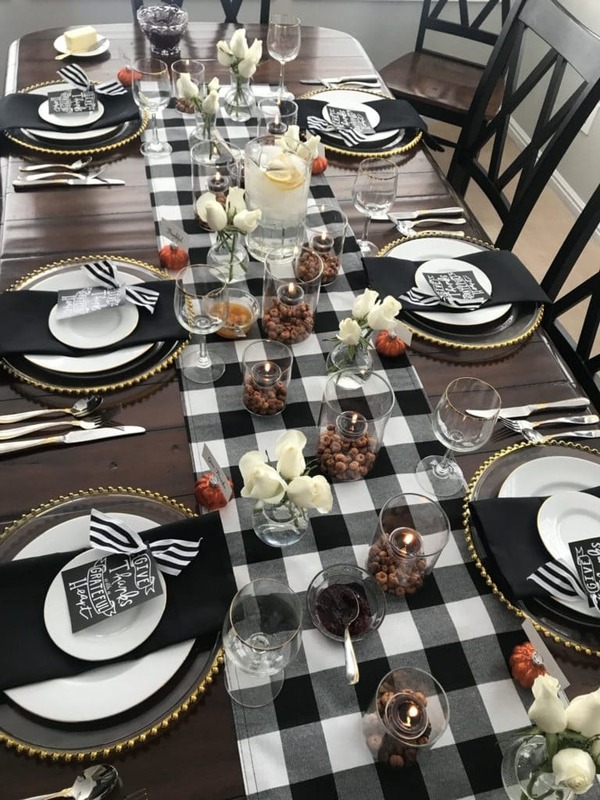 You can find an almost identical table runner here. 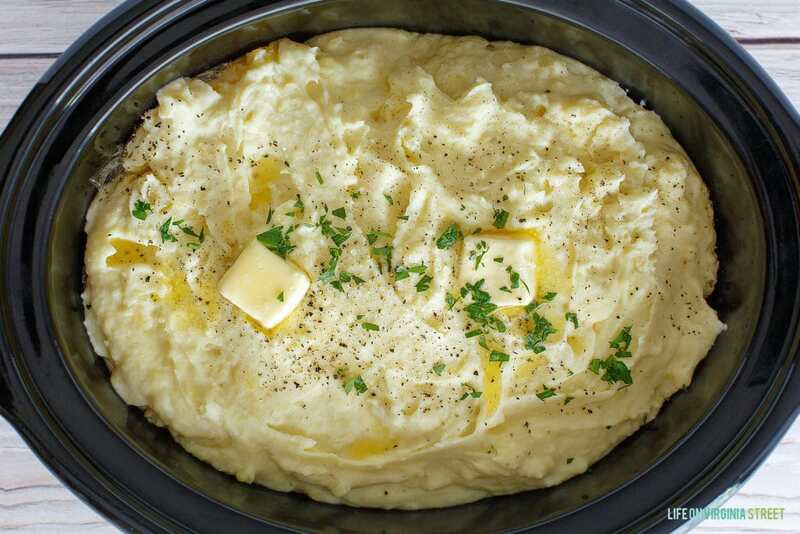 My mom put me in charge of my famous mashed potatoes and they didn’t disappoint! 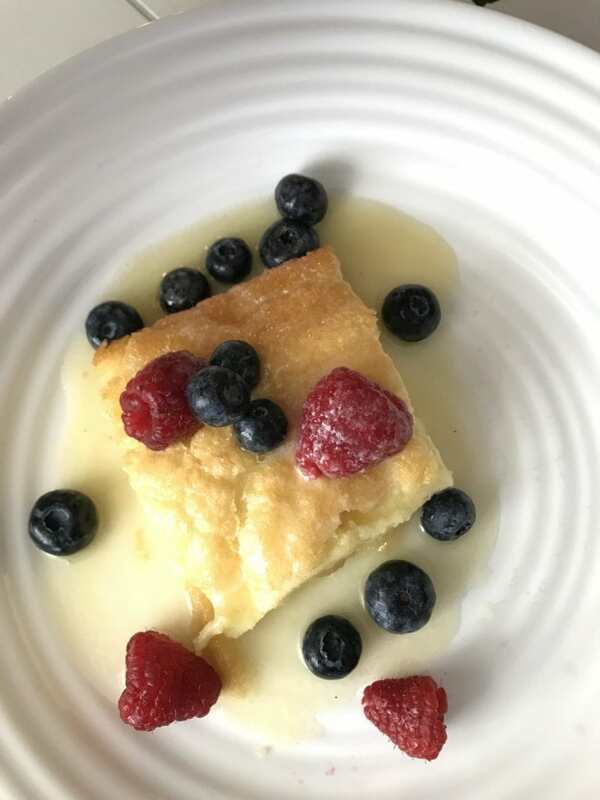 If you haven’t tried them yet, you can get the recipe here. I love that you can make them a week in advance (I made ours Wednesday) and then just heat in the crockpot! We all spent Friday morning in our pajamas hunting for the best Black Friday deals. My brother and sister-in-law had a morning flight and then we left around lunch time. It was such a great few days! 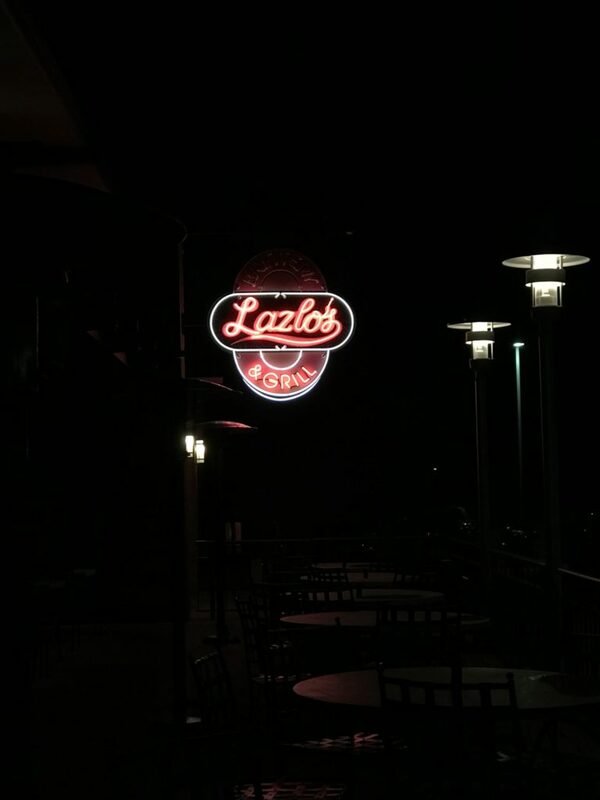 We got into town around dinner time on Friday night and we were both starving, so we hit up Lazlo’s for dinner. We were shocked by how much colder the temps had gotten while we were away! Saturday night, we had movie night at Nick and Jill’s. Their new house has a movie room and it was a fun way to make use of the popcorn machine I “made” them buy. 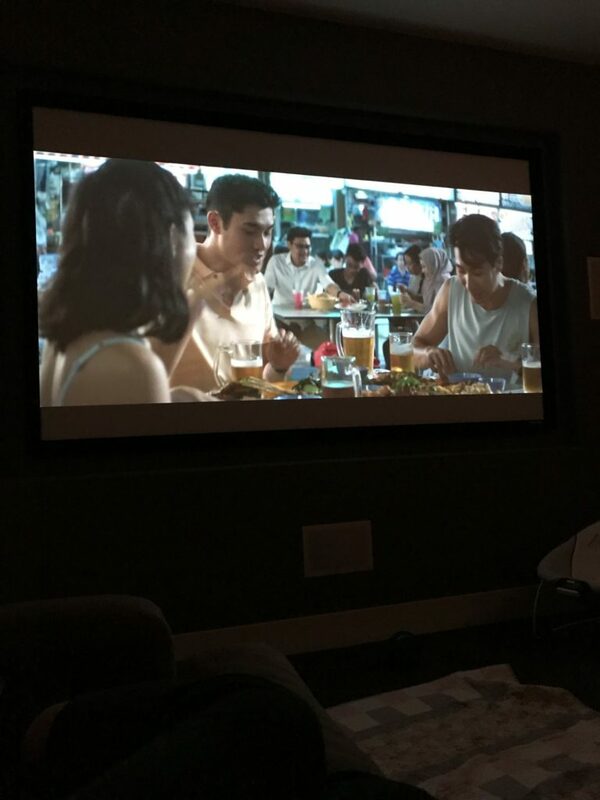 We watched Crazy Rich Asians and I thought it was really cute. I had been hoping to read the book before I watched it but now I’m more motivated to read it. 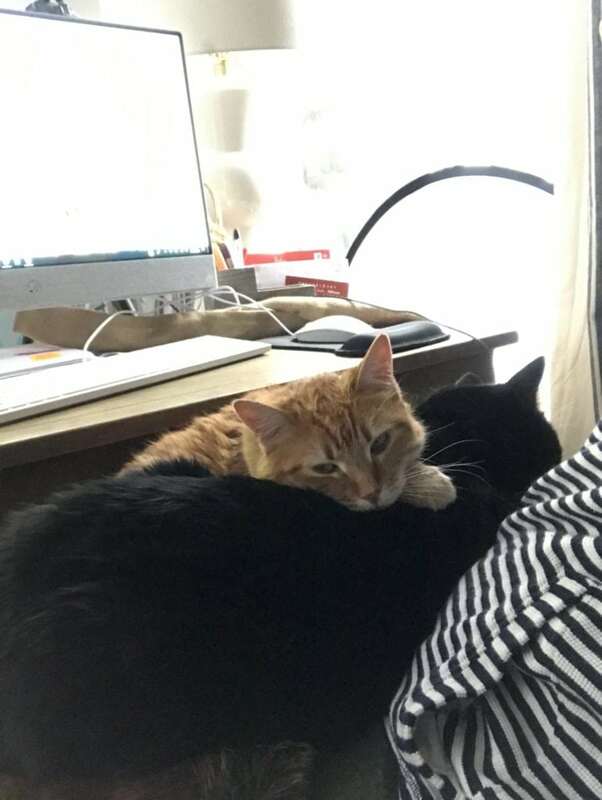 The cats definitely missed us while we were gone even though they had frequent visits from their aunt and uncle and grandparents. 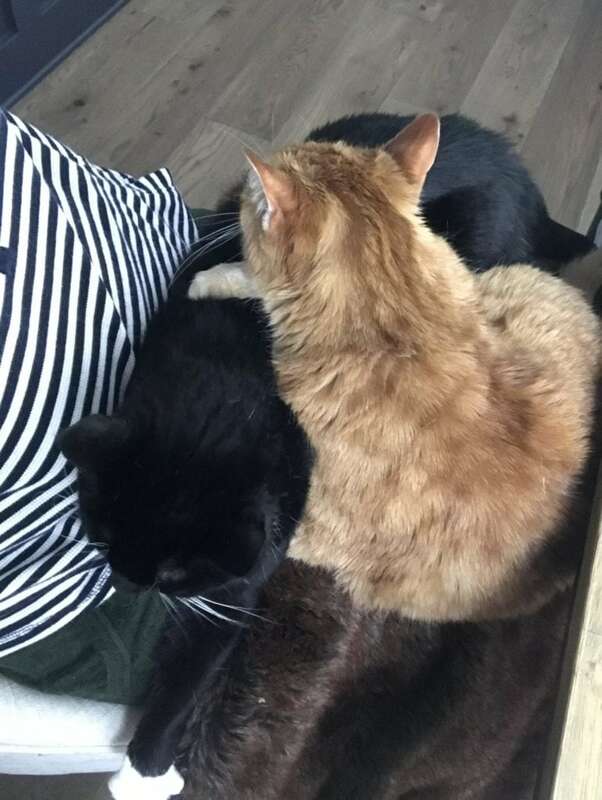 This was my lap situation on Sunday morning while I was trying to work at the computer. I’m still not sure how Bailey and Hawkeye both fit but it was so cute (even if it was rather uncomfortable for typing)! It was nice to have a few days at home after the holiday before heading back to daily life and work! A few recent favorite outfits. This coat is still one of the best deals out there and it’s so cute! And these glitter block heels (they also come in black) are surprisingly comfy and are a fun way to dress up a basic outfit for the holidays! This is the outfit I wore Thanksgiving day. 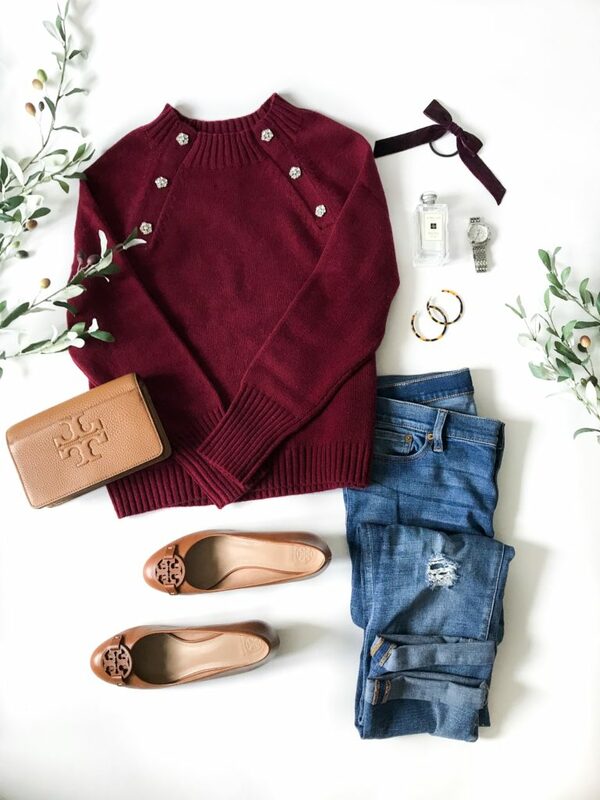 I’m in love with the sweater and it’s currently 40% off in all colors with code SNUGGLE. 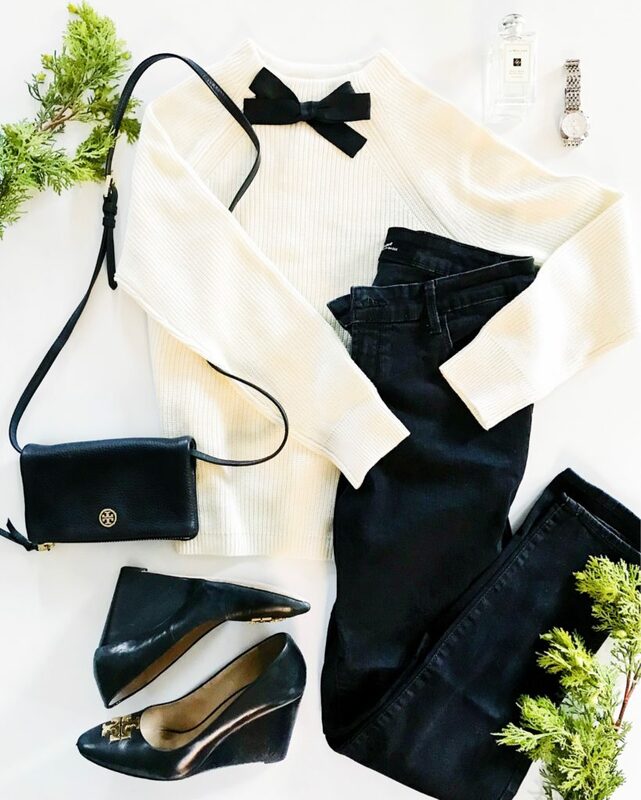 This was a favorite holiday outfit from last year, but the bow sweater is back this year and it’s currently 60% off in all colors! Enjoy the rest of your week! It’s hard to believe the weekend is almost here again!